Gauge blocks are fundamental standards for linear measurement. For adjusting, checking. or inspecting measuring instruments and tools, and precision workpieces. Gauge blocks are used either individually or in combination of several blocks which are wrung together. 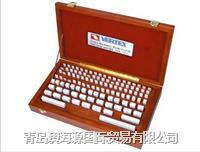 Steel gauge blocks are made of quality alloy steel. and carbide, the ceramics are also available. The hardness number of the measuring surfaces is no less than HRC64. The blocks have fine wear resistance, Ther are heat treated in special ways so as to stabilize their lengths.